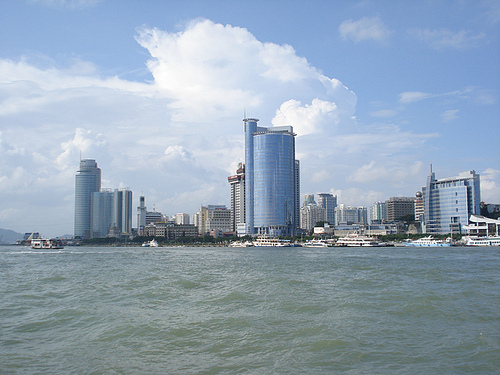 Located in China’s Fujian province across the strait from Taiwan, Xiamen is a bustling coastal city offering all the usual amenities for travelers with Western sensibilities (aside from the blistering hot summer weather) as well as a rich plethora of traditional Chinese culture and customs. As one of China’s original four special economic zones, Xiamen has enjoyed a great deal of benefit from foreign trade and investment making it more affluent than many other regions of China. Xiamen’s also very clean compared to the rest of urban China. Although there are days when thick smog hangs over the city like miasmic, fetid B.O. hangs in stale air, fresh ocean breezes usually dissipate the pollution within several days allowing you to actually see blue sky most of the time. A ten-minute ferry ride from Xiamen is a place of winding roads undisturbed by traffic, antiquated Victorian-era architecture, and mellow piano music wafting through briny air. Charming Gulang Yu (鼓浪屿) became a foreign enclave following the Treaty of Nanking in 1842. Today the 1km² island of 20,000 inhabitants emanates a relaxed and carefree aura enhanced by the artistic tendencies of its denizens, many of whom have become professional pianists. If only the streets weren’t filled with so many peddlers hawking all sorts of tsotchkes. Bagua Mansion - the owner vowed to build the first villa on Gulang Yu, bought a huge plot of land, and started building, and building, and building…for 13 years. It was never completed. Xiamen’s laidback pace of life is a much-needed respite for nerve-frazzled Manhattanites who seek a break from the Big Apple. Admire the massive architectural/engineering wonders of Fujian Tulou (which the US military once thought were communist ICBM silos), get attacked by Rhesus Monkeys and slide on high-altitude cables in Niumu Forest (牛姆林), or soak yourself in Riyuegu’s hot spring pools infused with lavender, rose hips, and other herbs. 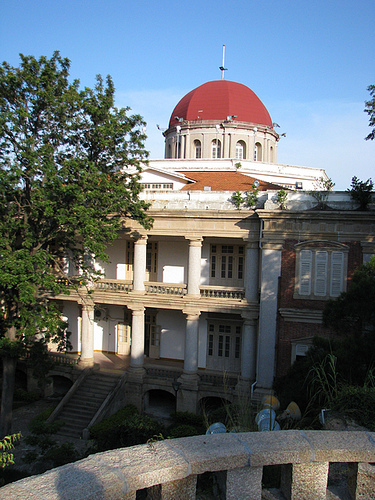 Huaiyuan Tulou in Nanjing County, Fujian Province built in 1909. These Rhesi are not timid. Carry a plastic bag and they will steal it right out of your hands.